How many days in Myanmar are enough to visit this beautiful country? This question often confuses our clients. 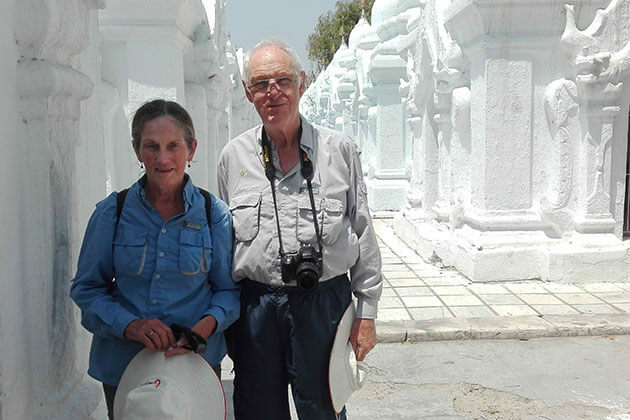 In Go Myanmar Tours, we offer Myanmar tour itineraries 5 days that gives you a good amount of time to get a glimpse at the country’s highlights. We suggest Myanmar itinerary 5 days that allows you to choose either to explore Yangon or gaze out at the charming landscape throughout the country during your 5-day tour in Myanmar such as the archaeological sites in Bagan, Kyaikhtiyo Pagoda (Golden Rock), and the magical Bago city etc. 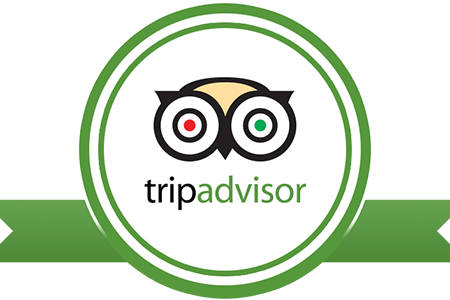 Whatever is your decision, we ensure to give you the most memorable time in your Myanmar 5 -day tour. 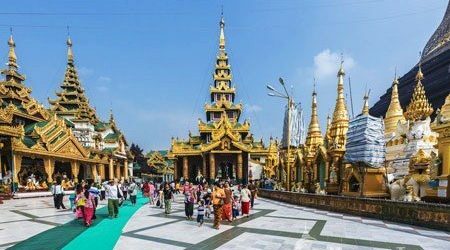 Let your heart enchanted in Yangon, the city built from the point of collapse and witness a lively urban in the transition toward modernization from dawn to dusk, you will have a great time for a taste of Myanmar 5 day trip. Not just sightseeing, the authentic Burmese food is also expected to feast your hungry eyes and fulfill your empty stomach. From the hustle and bustle atmosphere of Yangon, Myanmar itinerary 5 days will take you toward the north of Myanmar to visit an ancient capital of the country where is famous for numerous Buddhist stupas and temples. 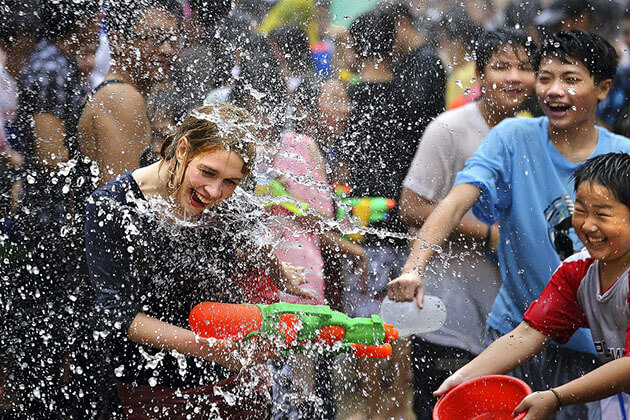 Feel a bit tired of the hot weather in Myanmar? Why don’t you highlight your Myanmar itinerary 5 days by a diving trip to observe the incredible coral reefs, shark, and more? 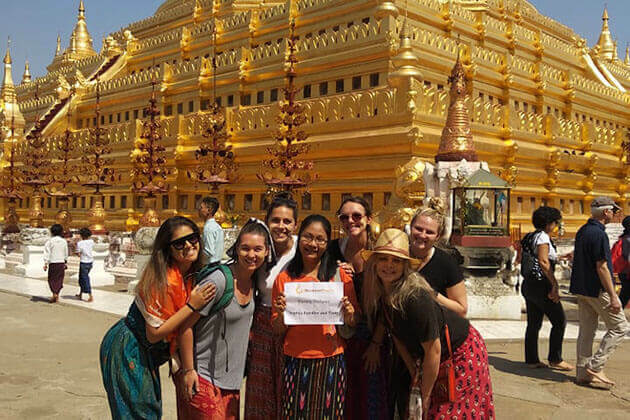 Go Myanmar Tours offers various Myanmar 5-day tours packages, ready-made trips, and travel service for you to choose from. 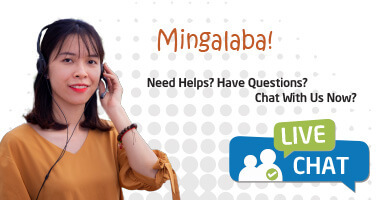 You can contact us for booking, consulting and tailoring a unique Myanmar itinerary 5 days to suit your budget and interests. Within 5 days 4 nights in Myanmar, our travel specialists have created a list of the most popular attractions to visit and things to do in Myanmar as below. 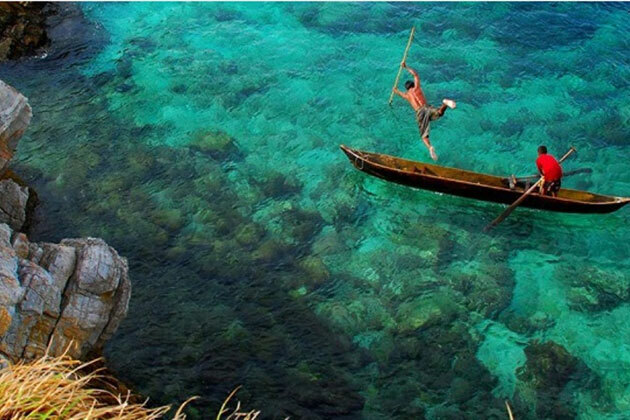 Let have a look and choose some to put in your Myanmar itinerary 5 days. Within 24 hours in Yangon, your Myanmar itinerary 5 days starts in the city center with a solemn visit to the 2000 years old Sule Pagoda located at the roundabout in the heart of the city. It is believed that the construction of the pagoda started in 2600 years ago from the time of the Buddha. 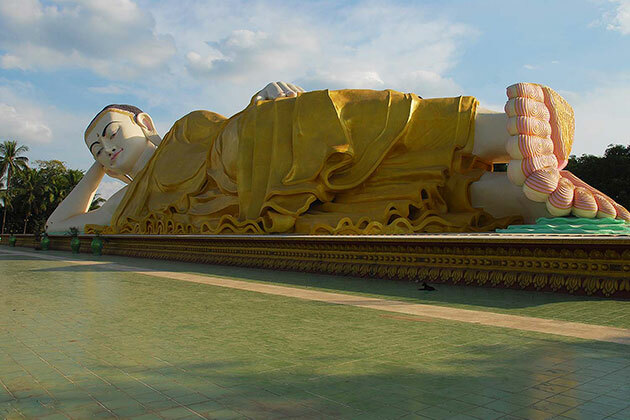 Toward the north of Yangon, head to the famous Chauk Htat Gyi Pagoda in Myanmar 5 day trips to marvel at the huge reclining Buddhist statue with 65 meter longs and 16 meters high. Apart from the sacred pagodas, 5-day tour to Myanmar take you to the National Museum will provide you with the collection of the Burmese arts, history, and culture especially the 8 meters high Golden Lion Throne. 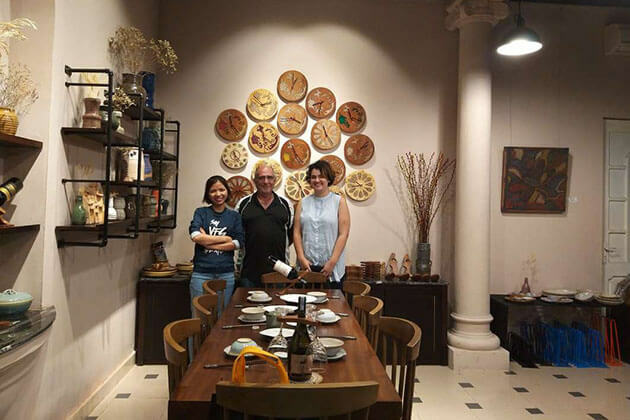 Step aside from the outstanding relics, a Yangon food tour in Myanmar itinerary 5 days will truly give you the best of Myanmar cuisine, and the essence of the distinctive cuisine through time. Your Myanmar itinerary 5 days will not miss a chance to soak you in the vibrant Bogyoke Aung San Market and let you witness at the daily trading of Burmese people. Perhaps Shwedagon Pagoda is truly the highlight in your 5-day tour in Myanmar to visit the most sacred and impressive historical relic in the country possessing 5448 diamonds and 2317 rubies. 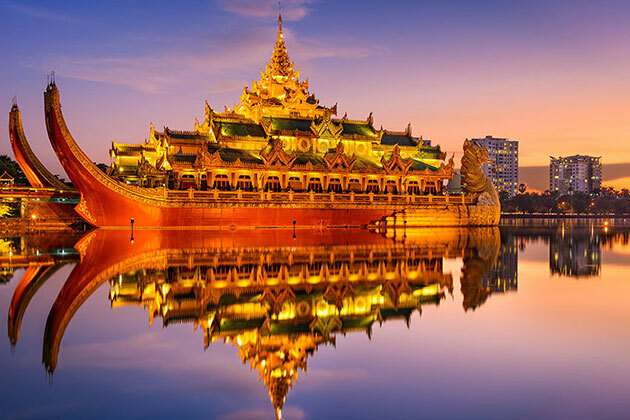 Ultimately, fulfill your Yangon city tour in your Myanmar itinerary 5 days by enjoying a traditional Burmese show in the Karaweik Palace – a giant golden barge on the Kandawgi Lake. Lies on Myanmar grasslands, Bagan is one of the most popular tourist attractions in Myanmar that we put in any Burma itineraries, and thus, it is the must-visit destination in your Myanmar itinerary 5 days. Unlike the busy life in Yangon, Bagan local lifestyle is quite idyllic and peaceful. Drop yourself on a two-wheel vehicle in your 5-day trip to pedal through the long sandy and dusty road, you will feel like it never ends. 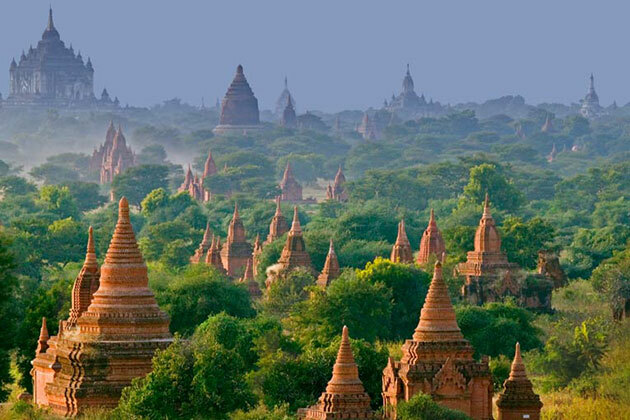 So far, Bagan has delivered to the human being with an amazing archaeological zone toward 3000 pagodas and temples. To explore the fascinating as well as the charm of the ancient Bagan in your Myanmar itinerary 5 days, join in a Bagan Temple tour to witness Bagan architecture in old pagodas, temples, and marvel at the spectacular view in the sunset over Irrawaddy River. Being known as the Land of Golden Pagodas, Myanmar is flecked with numerous glittering pagodas and so does Golden Rock – a sacred giant rock shrouded with the story of the Buddha that tourists should not miss in Myanmar itinerary 5 days. 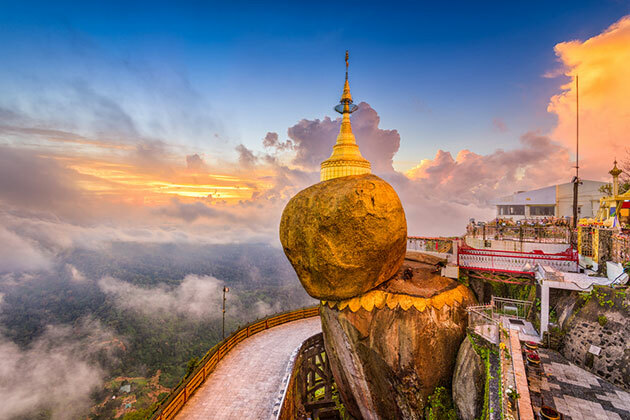 Situated 200 km from Yangon, the Golden Rock astonished people by its uneven contact to the ground. It required you to spend one day in your Myanmar itinerary 5 days to transfer and gaze out at the magnificent pagoda as well as witness the current of pilgrims visit the site. 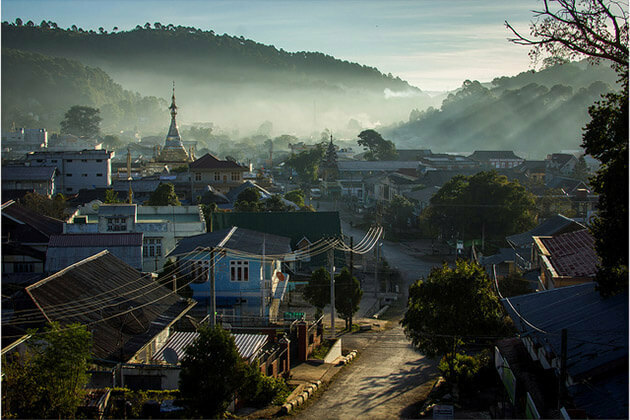 Step aside from the magnificent religious sites, Myanmar itinerary 5 days will certainly make you fall in love with the tranquility of the breathtaking scenery that is completely different from other destinations you have ever been to. 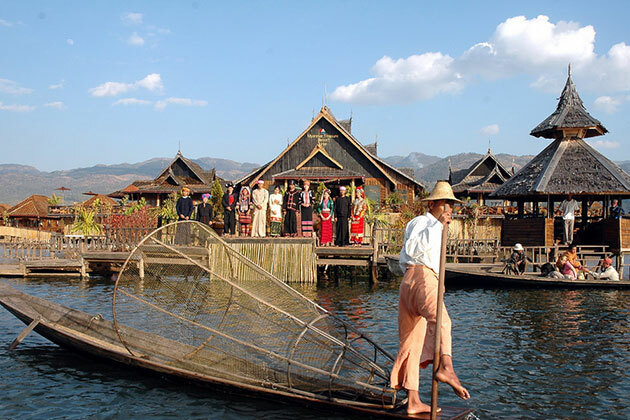 A boat trip around Inle Lake in Myanmar trip 5 days is perfect for you to take a glimpse at the life of Burmese people who travel on boats rather than motorbikes. Children living on the lake often learn how to row the boat in their childhood instead of riding a bike. Furthermore, Myanmar itinerary 5 days delivers you a chance to get the first-hand experience about the unique way of life of the local people making their life entirely from the water. You will be surprised by how they do farming on the water with the lush tomato gardens. Burma itinerary 5 days with the next stop in In Phaw Khon village will introduce you the distinctive fabric weaving from the lotus stems. 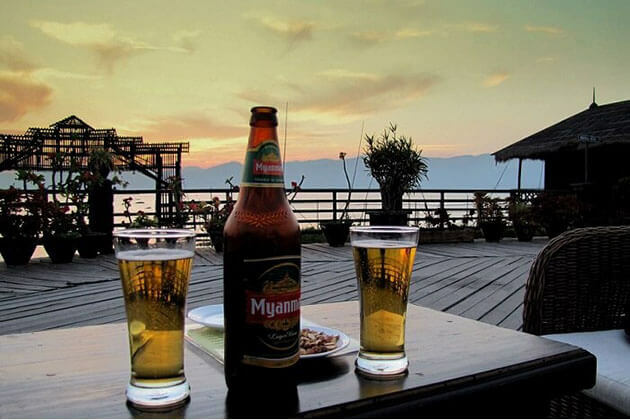 Ultimately, do not miss the opportunity in Burma itinerary 5 days to cycle to the Red Mountain Estate where you will taste Myanmar wine whilst sitting on a chair and beholding the majestic sunset. How interesting is it? The beautiful Bago city is the next spot in Myanmar itinerary 5 days that will deliver you to the former capital of Myanmar which is much similar to the Disney Land with marvelous pagodas and colorful buildings. The peaceful land will appear as you head to Bago from Yangon in Burma itinerary 5 days to visit outstanding relics such as the gorgeous Shwethalyaung Buddha where tells you the sad love story of the prince with a Mon girl even though she was a Buddhist leads to the construction of the pagoda. Additionally, the Shwemawdaw Pagoda will make you almost scream in 5 day trip to Myanmar, with 114 meters high, Shwemawdaw Pagoda marks itself as the highest golden pagoda in Myanmar. Passing through the Shwemawdaw temple, you will reach Hintha Gon Paya – a small temple will tell you a special story on your 5-day trip. Lying on the vast area, the legend said that it was the only place raising above the sea level and thus it was the preferred landing place of the mythical bird. Step aside from the inland attractions of majestic pagodas, Myanmar itinerary 5 days also offers you a chance to explore the heaven of Myanmar in the breathtaking Myeik Archipelago. Lies on the Andaman Sea coast of southern a Myanmar, it is in the transition to becoming one of the main Myanmar tourist attractions to visit in Myanmar trips 5 days. Over the past few years, the archipelago has witnessed the ongoing development of Myanmar tourism and started to raise the curiosity to visitors. 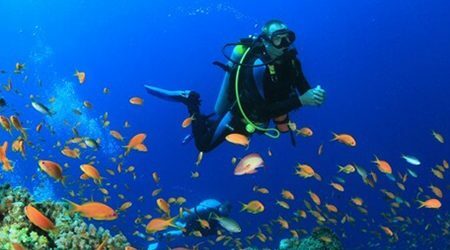 With the collection of 800 islands, Myeik is a wonderful archipelago to visit in Myanmar itinerary 5 days to observe the Myanmar marine life with 288 species of colorful coral reefs, 618 of fish, and impressive white sands. It is a great opportunity to observe the diverse flora and fauna in some gorgeous islands including Kawthaung, home to the poetic beach scenery; Kyat Mauk, the beautiful island with spectacular limestone cliffs, caves and white sand beaches. Along with exploring the sea, Myanmar itinerary 5 days in Myeik Archipelago takes you to the spectacular landscape of Honour Rock to capture the wonder of a huge sea fan forest, cave, and sharks, frogfish, guitarfish, and a bunch of lobsters.